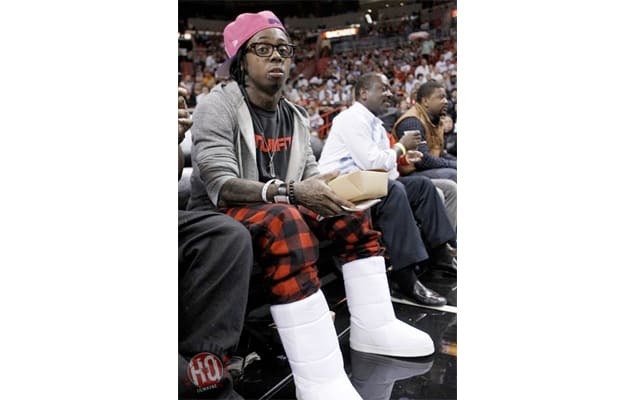 Recently, Lil Wayne has been all about moon boots and snowboard boots. In the past few months, we&apos;ve seen him rock the winter footwear on several occasions, from NBA games to music videos. Seems like it might be Weezy&apos;s latest obsession. A few days ago, he sat courtside with Mack Maine at the Miami Heat vs. New York Knicks game at the American Airlines Arena in Florida. The YMCMB rapper stunted in a couple of pieces from his TRUKFIT clothing line and, of course, a pair of Terrence Koh x Opening Ceremony x Forfex Moonboots. Look out for TRUKFIT at Zumiez stores across the country and Zumiez.com, as well as Karamaloop this February. As for the moon boots, they&apos;re available now at Opening Ceremony for $200 if you&apos;re interested.